How can design thinking be integrated with, and applied to quality practices? Background: Design Thinking is a collection of methods and mindset that evolved at Stanford University and has now entered the mainstream in almost every industry. While the design thinking stages and methods might appear to be a framework, the essence of design thinking is the focus on ‘empathy’ and ‘experimentation’ to design innovative, meaningful and people focused solutions. There is no dearth of frameworks, toolkits and methodologies for quality management and continuous improvement. 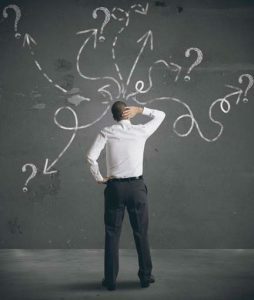 For example, a methodology like DMAIC (Define, Measure, Analyze, Improve, Control) provides a structured set of methods for continuous improvement along with a set of problem-solving tools and techniques for each stage in the methodology. DMAIC provides an opportunity to assess the current state using quantitative methods and prioritize problems/ opportunities for which solutions have to be implemented. Metrics to qualify the current state and for measuring effectiveness of the solutions implemented are typically tagged to business objectives which ensures that employees understand the alignment between improvement initiatives and the potential impact of outcomes on business objectives. 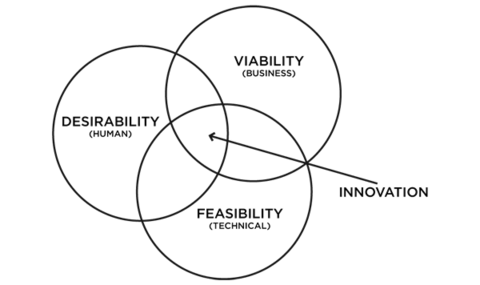 If we use the Visual-01 (below) from IDEO as a reference, traditionally quality and continuous improvement initiatives are largely driven by viability and feasibility considerations. Integrating design thinking with improvement initiatives brings the ‘human’ element into focus, by driving conversation on ‘desirability’ of the solutions being proposed for implementation. When desirability is considered alongside viability and feasibility on quality and continuous improvement projects, it significantly improves change management and adoption. This approach also significantly increases the odds of institutionalizing and sustaining changes and ensures the effectiveness of the changes. Use of empathy as a facet to characterize current state brings more focus on the users (internal or external customers). Applying empathy alongside prototyping to evaluate alternate solution options for the future state improves engagement from the user community and will have a positive impact on the pace and extent of adoption. An informed and engaged user is more likely to be a champion for the solutions being implemented. The combination of traditional metrics and qualitative data supporting the desirability dimension can provide a new perspective for prioritizing and driving improvements. 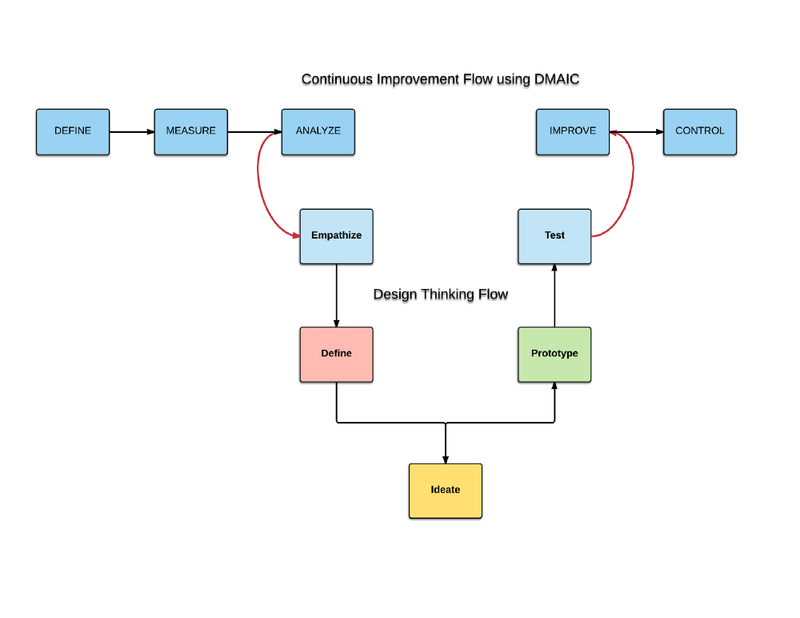 Visual-02 shows the integration of a Design Thinking flow represented by the steps Empathize, Define, Ideate, Prototype and Test with the DMAIC approach for continuous improvement. Integration of design thinking methods to adopt a humanized approach to characterizing (challenges and opportunities) current state. On similar lines, engaging internal and external customers to experiment and improve in a culture of play can lead to solutions that are desired by the user community and enable the quality practitioners ability to sustain and scale the improvements. I have used the design thinking approach and methods on large transformation initiatives and during Kaizen events and I have seen significant impact on participants’ enthusiasm and engagement. The ability to empathize and experiment puts a human face to quality and process improvements and I would highly recommend design thinking to quality practitioners. I look forward to hearing from my peers on their experience with design thinking. Design Thinking is a strategy-making process that focuses on customer behaviors rather than opinion (aka tribal knowledge) and market research. There is a lot of press lately about Design Thinking concepts, applications and examples in the development of new products and opening new markets. Design Thinking was popularized by David M. Kelley and Tim Brown of IDEO and Roger Martin of the Rotman School. A very good, short video on the topic was recently published by the Harvard Business Review blog . For a more detailed explanation please read the paper, “Design for Action” written by Brown and Martin. From a paper recently published by Creativity At Work, “Design Thinking is a methodology used by designers to solve complex problems, and find desirable solutions for clients. A design mindset is not problem-focused, it’s solution focused and action oriented towards creating a preferred future. Design Thinking draws upon logic, imagination, intuition, and systemic reasoning, to explore possibilities of what could be—and to create desired outcomes that benefit the end user (the customer)”. What differentiates Design Thinking from traditional Voice of Customer collection approaches is the emphasis placed on observation of behaviors rather than relying on customers’ input to satisfaction surveys. Survey responses tend to validate Expected Quality and rarely reveal Exciting Quality opportunities (see “Kano Model”). In this way, Design Thinking is similar to Focus Panels and “Be the Customer” methods to better understand unarticulated customer needs. 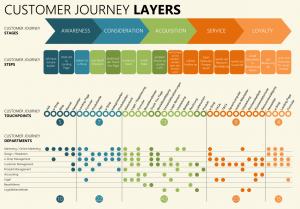 It is at this stage of Design Thinking that the Quality practitioner has the unique opportunity to innovate through the introduction and incorporation of Journey Mapping to document customer experiences throughout the value chain of the producer-customer relationship, from product awareness to purchase and after-sale touchpoints. The stages in Design Thinking around Ideation and Prototyping should look very similar to your existing Product Development and Commercialization processes. Many such approaches use a stage-gate model to prototype, test, and refine product design to evaluate customer acceptance and verify production cost estimates. Quality’s role in this stage should be to coach and consult in the proper use of experimental design to minimize experimentation costs and identify potentially important interactions of inputs and process variables to optimize performance of customer needs. 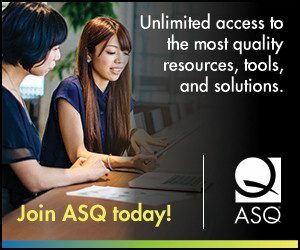 Another unique opportunity in the Design Thinking process for the Quality professional is in the final stage of bringing the new concept to life. With the help of social media the properly trained Quality professional can analyze customer / consumer feedback to validate areas of satisfaction and dissatisfaction, focusing on opportunities to build loyalty and engagement. One can debate whether Design Thinking is really all that new or novel an approach to the value creation process. Design Thinking reinforces the power of understanding customer behaviors and unarticulated needs to deliver Exciting, innovative new product and service offerings for improved customer satisfaction and engagement… and potentially opening whole new markets. Per Linda Naiman (Creativity at Work), “Design Thinking minimizes the uncertainty and risk of innovation by engaging customers or users through a series of prototypes to learn, test and refine concepts”. The Quality professional might also consider how Design Thinking and Journey Mapping can help him/her to innovate their professional services portfolio for increased customer satisfaction in teaching, coaching and consulting outcomes. Design thinking is a systematic and collaborative creative problem solving approach focusing on customer needs, getting information by direct observation, and testing it in a disciplined way. Similar to the Lean startup approach, the key is to fail fast and fail often. Even Toyota production system promotes investigating as many alternatives as possible, to find the very best solution, and always urge to propose ideas and fail as fast as possible. 1) Invent the future: With design thinking you should imagine what could be, in the ideal world, with limitless boundaries. You need to think what your customer may want but don’t know. The way to do that is by “Camping out” with your customers, like Home depot does. They talk to customers, ask how their experience was, ask questions like “did you find what you expected, what about the price, was it easy to find?” Sometimes a customer just want something fast, meaning buying a product in your website in just three clicks. That is what you need to discover through observation, what is “unstated”. Customer know they want to Get from a to b, but don’t know how. You need to find out the best way by immersing in their lives, observing and asking questions. Ideas for product changes may be related to new products, pricing or new store displays. 2) Test ideas. You can do Mindmapping to write down ideas after observation, and then test those ideas. Do first individually, and then test it with your team mates or even with your customers. Remember, don’t judge, simply think and write down. Use cheap materials, or partial solutions or Rapid prototyping tools. It does’t have to look perfect at first. The idea is to go fast, to be able to adjust fast. 3) Bring the new product to life. Identify resources and activities to implement the new ideas. Plan how to produce, distribute and sell the product or how to change the process. Design thinking can be used in any type of industry. A health provider for example used it to re-engineer nursing-staff shift changes. Close observation of actual shift changes, combined with brainstorming and rapid prototyping, produced new procedures that radically streamlined information exchange between shifts. The result was more time for nursing, better-informed patient care, and a happier nursing staff. The Innova School System, for example, with 23 schools thus far, is applying design thinking across its platform, from how the classrooms are built to the curriculum. and the UK’s Design Policy Unit as described in Tim Browns’s first article on Design Thinking for HBR. Samsung Electronics manufactured inexpensive, imitative electronics for other companies. Its engineers built products to meet prescribed price and performance requirements. In a company that emphasized eﬃciency and engineering rigor, the designers had little status or inﬂuence. Then, in 1996, Lee Kun-Hee, the chairman of Samsung Group, frustrated by the company’s lack of innovation decided that in order to become a top brand, Samsung needed expertise in design, and set out to create a design-focused culture that would support world-class innovation. It took a long way until getting everyone in the company on-board, but they finally made it. Now Samsung innovation process begins with research conducted by multidisciplinary teams of designers, engineers, marketers, ethnographers, musicians, and writers who search for users’ unmet needs and identify cultural, technological, and economic trends. Design thinking for them means three major things: empathy, visualization, and experimentation in the marketplace. Tech companies are using quality tools to organize their innovation cycles, likewise automotive, manufacturing, or even consulting industries more focused on standardization should start using quality together with design thinking so as to get a disciplined empathetic approach to customer requirements.